NASDAQ 5000. Bubble or is This Time Different? Almost 15 years to the day after the NASDAQ last closed above 5000, the index finally breached that level again, albeit for only one close, so far. That means that if you invested in the NASDAQ in March 2000, it took you 15 years just to get back to break even, which doesn’t sound like such a great investment. Between then and now, the NASDAQ lost 78% to its October 2002 bottom and rallied 351% to its recent high. That’s a lot of volatility for sure! While the close above 5000 was just another round number to the bulls, bears from all walks of life came out of the woodwork warning of the same demise that befell the index when the Dotcom bubble burst in 2000. Even Mark Cuban with similar arrogance and pomposity of Donald Trump shouted on all the major business channels about the new NASDAQ bubble. Cuban did later walk that back a bit, claiming he meant in the private markets not the publicly traded ones. So, is this time really different? 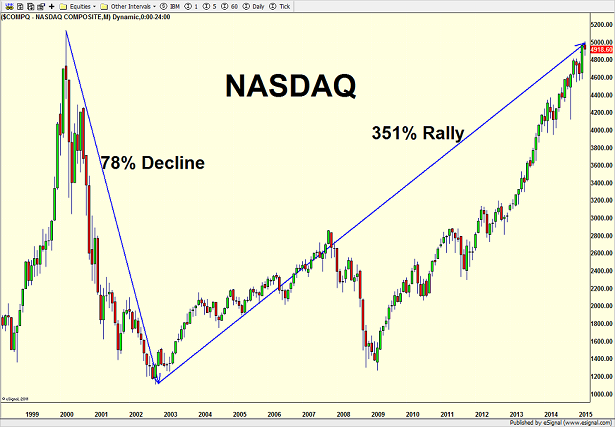 Or is the NASDAQ in a bubble that’s about to burst? Longtime readers know how I feel about the market in general and the NASDAQ isn’t much different. First of all, with a 15 year return of 0%, how can anyone really get excited that it’s a bubble or excessive? Yes, I know we can start the study from October 2002 and end up with a wildly different result, but no one is arguing that the NASDAQ has gone parabolic. That’s just silly. Looking at some routine fundamental data, analysts often use price to earnings ratio to compare stocks or indexes at different times in history. This number divides the price of a stock or index by the earnings and tells us how much it costs fort $1 of earnings. While this data is easy to obtain on most stocks it is very inconsistent on the NASDAQ going back. At the peak in 2000, I saw as low as 30 times earnings to as high as 200 times earnings. Today, the number 21, at least 50% away from the lowest estimates and worlds away from the insanely high ones. Yale professor Robert Shiller’s unique cyclically adjusted (CAPE) ratio was an all time high 44 in 2000, but 25 today. Another measure of valuation is the price to book ratio which price divided by the book value. In 2000, it stood at 5.1 while today it’s almost half at 2.6. On a non-scientific sentiment front, individual investors were falling over themselves trying to buy the next great Dotcom company. Day traders became heroes and were featured in the Wall Street Journal, Bloomberg and CNBC. People were quitting jobs to day trade a few hours a day for multiples more money. I remember getting stock tips from my trainer at the gym. An old golf buddy’s wife came screaming on to the driving range that they were making millions and should retire to do this full time. 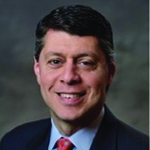 My former doctor fired me as his advisor at the end of 1999 for not embracing the new paradigm. He said I didn’t get it anymore. There was a new kind of investing and I was being left behind. Wall Street Internet analysts like Henry Blodgett and Mary Meeker became rock stars. Ryan Jacobs launched an Internet mutual fund and became a celebrity. Investors were told to ignore earnings and just focus on “eyeballs”. Not only did most of the technology initial public offerings (IPOs) not make money, many of them didn’t even have revenues! Finally, the NASDAQ index melted up 278% from October 1998 to March 2000, the absolute epitome of a parabolic, bubble’esque advance. The best price move I can find of late saw the index jump 78% from November 2012 to March 2015. As has been the case since early 2012, the bears have been completely misguided. They continue to believe in their conspiracy theories or manipulation by the global central banks or aliens landing at the NYSE and taking over. Bull markets form when it’s darkest with fear and despair abound. They continue to rise on optimism and eventually die on greed and exuberance. It’s very hard to make the case that death is imminent. One day, the bears will be right and scream from the rooftops that they were just early. But we all know that they were just plain wrong for too long.